A handful of powerful city leaders from both sides of the aisle met Friday morning, renewing negotiations for tax increases to expand the Convention Center and create new revenue sources to address the city’s homelessness and affordable housing crises. San Diego power brokers are back with a new attempt to expand the Convention Center. Leaders from the mayor’s office, Downtown Partnership, labor, the tourism industry, and community activist groups met Friday morning, renewing negotiations for tax increases to expand the Convention Center and alleviate the city’s homelessness and affordable housing crises. The meeting took place at the offices of the San Diego-Imperial Counties Labor Council, an umbrella group that represents many of the region’s labor unions. The Friday meeting also included Kris Michell, CEO of the business group Downtown Partnership; Mike McDowell, director of the San Diego Lodging Industry Association; Robert Gleason, CEO of Evans Hotels; Murtaza Baxamusa, policy head for the San Diego Building and Construction Trades; Rick Bates, research analyst for Unite Here Local 30, San Diego’s hotel workers union; Ismahan Abdullahi, an organizer for the progressive advocacy groups Partnership for the Advancement of New Americans and Build Better San Diego; Michael McConnell, a homelessness advocate who previously conducted a poll on a ballot measure to raise taxes for homelessness needs; Laura Fink, a Democratic political consultant; and Joe LaCava, a land use consultant and community planning advocate. Leaders walking into the meeting said they’ve yet to agree to a bipartisan deal to revive the Convention Center expansion. 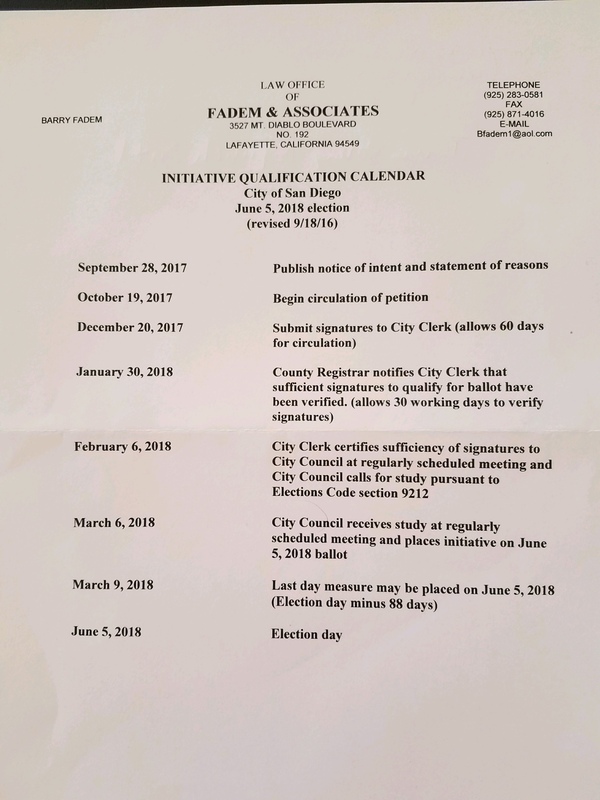 A document obtained by Voice of San Diego from a previous meeting, written by the law firm Fadem & Associates, lays out a timeline for a citizens’ initiative that would appear on the June 2018 ballot. It says the group would need to publish a notice of intent for the initiative by Sept. 28, and begin circulating a petition by Oct. 19 so that it could turn the signatures over to the city clerk for certification by Dec. 20. The 2018 primary election is June 5. Earlier this summer, Faulconer proposed an increase in the city’s hotel tax to pay for the expansion, and create new revenue for homelessness projects and infrastructure improvements. The City Council rejected his proposal, with all five Democrats voting against it and the four Republicans siding with the mayor. Progressives and the labor movement led the charge to strike it down, citing disagreements with both the proposed distribution of the funding and the timing of a special election. Since the City Council rejection of the mayor’s proposal, there have been two potentially significant developments. One is the Hepatitis A outbreak that has killed 16 residents and has especially endangered homeless people. The other is a ruling by the California Supreme Court that may have created a loophole for citizens’ groups to pass a tax increase for a special purpose – like a Convention Center expansion or affordable housing – with just 50 percent voter approval, instead of the usual two-thirds threshold. That opportunity is far from certain, but it would require the measure to be placed on the ballot through a citizens’ initiative, not a vote of the City Council. McDowell confirmed the group was discussing a citizens’ initiative for a measure to expand the Convention Center. He said it was not identical to the mayor’s previous measure. Michell said there were no details yet because discussions had just begun, and would not say whether the group was aiming for the June 2018 election. Bates, the representative from the hotel workers union, would say only that there has been no deal reached yet. One of the main arguments by liberal and union groups against the mayor’s previous push was the passage last year of Measure L, which stipulated that ballot measures should be voted on in November general elections when turnout is highest, unless there are pressing outside circumstances. Those groups may argue that the hepatitis A outbreak, or the Supreme Court ruling, or both, would qualify as pressing outside circumstances. The proposal on the table, according to two sources involved in the discussions, actually includes two separate ballot measures. One would raise hotel taxes for the Convention Center and homelessness. The other, potentially a real estate transfer fee, would go toward building low-income housing. The outlines of that agreement could change as discussions continue. McConnell would not confirm or deny that arrangement. Abdullahi, though, echoed Michell’s restraint.